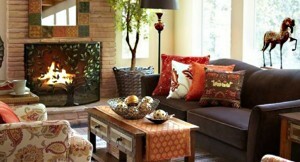 When the weather starts turning cooler and it’s time to get your home ready for fall, embrace all the festive colors. Spruce up your space with a few inexpensive additions that make a cheerful impact. 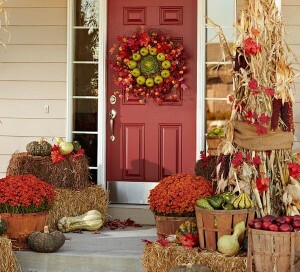 Make a good thing even better by adding an assortment of pumpkins, gourds and colorful mums to a front entry. The apple baskets add a nice touch and are handy holders for the gourds and small pumpkins. Fall marks the start of the holiday entertaining season making it a great time to spruce up areas of your home where guests gather, like the foyer. 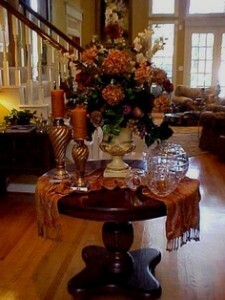 Touch-up scuffs on stair risers and add an entry table large enough to display a few decorative accessories. A pair of occasional chairs or long bench provides a spot for guests to remove boots or just sit for a chat. Give an open, soaring space a snug, welcoming feel by swapping out pillows in lightweight summer fabrics, like linen and cotton, for luxe velvet ones in rich, fall shades. Add a few coordinating throws and get ready to cozy up by the fire. Nothing brightens up your home for the season like vases filled with fall flowers. 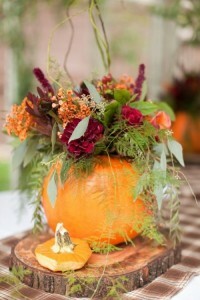 By using a pumpkin as a vase, you get twice the decorating. Remember the trick to keeping blooms fresh is to remove all leaves below the water line and change out the water every few days. A tall vase filled with orange blossoms creates a show-stopping fall arrangement in this living room. 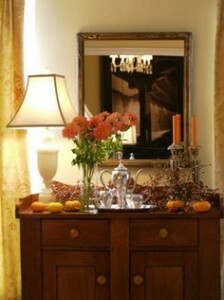 Adding the orange candle, pumpkins and creamy lamp on top of this antique chest, warm up this cozy corner. 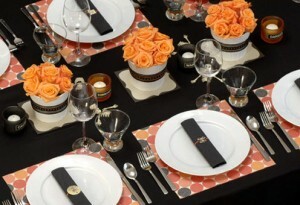 “Less is more” when describing this table setting. 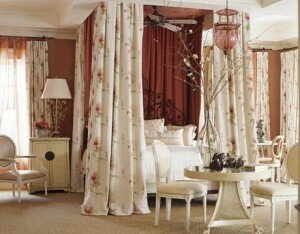 Certainly, the look is minimal but it’s far from sparse. By limiting the color palette to shades of brown, orange and white, you create a table that is warm, polished and oh so chic. For most of us, fall is the last hoorah before winter’s blustery weather truly sets in; enjoy a walk in the crisp air to gather clippings of flowering plants and colorful foliage. Fill small vases with your finds and place them throughout the house. If you’re expecting overnight visitors, don’t forget the guest room. 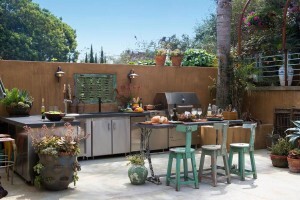 Enjoy cooking outdoors with your outdoor kitchen decorated with all the fall colors! Add color from the fall foliage and some pottery dishes in the fall colors. 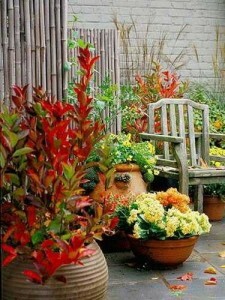 Throw some fall colored pillows on a bench to enjoy the brisk air as well. You can find all your outdoor grilling needs at Hermitage Appliance Division. Get inspired by professional works and create charming and impressive fall flower arrangements for your backyard and front yard decorating. All you need is a planter, some soil and blooming in fall plants that delight us with yellow, orange, red and purple flowers. Combine fall flowers in different color shades or create vivid color combinations for your backyard and front door decorating. These are just a few ideas! Now go out there and have fun decorating for the fall. 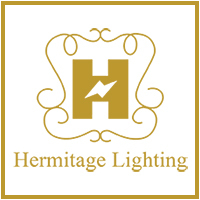 Remember, at Hermitage Lighting Gallery we have lots of accessories for your fall looks.